2 Hours Drive from Tokyo fills a very real gap in the otherwise well-stocked market for Tokyo guidebooks. 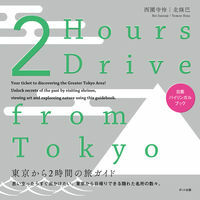 Current guidebooks to the Japanese capital repeat a similar set of facts and figures from a clichéd list of destinations, but 2 Hours Drive co-authors Saionji and Hojo have made a remarkable innovation, seducing their readers to the edges of the megalopolis and to the subtle depths of Japanese culture and history. Limiting themselves, as the title suggests, to places within a two-hour drive from the city, the authors have selected sometimes surprising, but still classically beautiful locales that speak to the core histories, stories, and beliefs of the Japanese people. In addition to leading readers off the beaten track, the authors dedicate the majority of their pages not to the usual humdrum of transport and restaurant options, but to seriously explaining how the sites they’ve chosen are unique within Japan and convey meaning about the country. This is not to say the book lacks important practical details. To the contrary, there are plenty of tips to guide you where you need to go. This is the perfect guide for the curious Tokyo expat, the foreign resident in Japan, or the truly intrepid tourist visiting from afar. But since every destination features a two-page Japanese supplement alongside the four color English pages, the book is also useful for Japanese readers who would like to guide their foreign friends or who like a bit of bilingual armchair travel. Although it features one site each in Tokyo and in Kanagawa Prefecture, this photo-rich guide is instead mainly oriented towards the perimeters of the Kanto Region: Chiba, Ibaraki, and Tochigi on the one hand, Saitama and Yamanashi on the other. The destinations are always worth the effort, and this guide makes your first step very easy.